Keeps handy items near and secure at all times. Oversized swivel clip is attached to unbreakable coil. 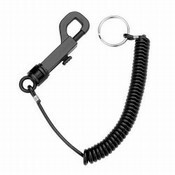 Coil extends 3 ft and retracts to 4 in. Snap hook clip attaches to belt loop, purse, briefcase or bag to keep your keys, change purse, pocket tools, whistle, flashlight, etc. readily available. Color: Black.